This spectacular 154 year old establishment is located in the heart of Abbortsford. The Park Hotel recently underwent a refurbishment that kept the rich history intact by upholding a modern day look inspired by a 1950's-1970's Australian themed decor. Tint Design re-skinned the illuminated outdoor signs that are bold enough to catch the attention of its patrons but also compliments the traditional architecture found in this inner-city Melbourne suburb. Re-branded Signage reveals a business's potential to customers and can differentiate one business from another, however, the signage must be eye-catching and effective or else it will loose it's serving purpose. The inverted use of a of a single natural colour in this design is what makes it stand out, rather that the contrast of multiple bold colours that would act as more of an eye-sore than an invitation in this location. Along with the new face-lift The Park Hotel is now also under new management which includes an exceptional menu and wonderful staff, and the two open fire places that have been kept as a feature will be so inviting for these chilly weeks ahead in Melbourne. Here at Tint Design we are generally well known for our services with window film and Wall Graphics, after all, it's where our business started. However clients continue to be surprised that we are also in the business of Signage. For us, it was a natural progression to enter the signage market as it overlaps with the work that we do and now allows us to create a complete, decorative, functional, or promotional package for our clients. Recently we announced that we are now producing our own braille signage, however this is just another element in the list of signage solutions that we have provided for years. Digital, Precision Cut, statutory, directional, promotional, internal, external - we do it all! Tint Design Teamed up with Clarke Hopkins Clarke to produce this recent install of 3D acrylic letters and logos to the exterior of Bendigo Tafe. It's clean, bold and professional and goes beyond serving its purpose as signage branding. Give us a call if your Signage desires an update! Zodiac signs play an integral part in Chinese culture and can be used for example to determine one’s fortune for the year ahead. 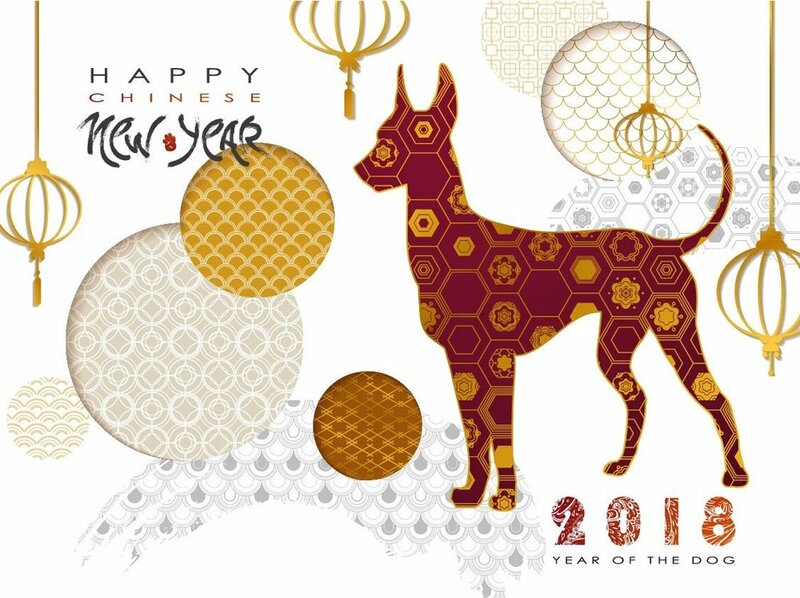 There are 12 Chinese zodiac animals used to represent years and 2018 is the year of the dog! Honest and loyal, dogs are the truest friends and most reliable partner, so not a bad person to have around! With a New Year, comes a fresh start. A time to review your surroundings and remove, update or renew them. This may include your workspace or branding. It may be a good time to install some fresh new signage, create some interest on your glass panels with some precision cut or digital imagery or brighten your walls with wall graphics or printed acoustic panels. If this is something that is on this years ‘to do’ list, please contact us at Tint Design and we’d be happy to help you get your year off to a fresh new start! We can't believe it's that time again but here we are closing off another year. 2017 has been another big one for Tint Design with the addition of new staff members and sophisticated machinery. It was also a year that pushed us further than ever before both creatively and, with the assistance of our new equipment, increased the volume of product that we were able to get out the door. While this time of year is relaxing and festive for most, we at Tint Design understand that our industry colleagues are no-doubt as busy as we are right now and can only wish you and your families a very safe and, once you get to it, a well deserved break! We sincerely look forward to working with you again in 2018 and are already excited about some of the projects you have in store! Click on the image for more examples of creative Schiavello hoardings! Construction hoardings can sometimes be a depressing eye-saw within an urban landscape. However, our friends at Schiavello not only see them as an opportunity but are also utilising their full potential for what they really are; a giant temporary billboard. When you consider the fact the bill posters and street artists have known this for some time and often capitalise on the vast areas of free canvas by slapping up all kinds of promotional posters, artworks and tags, it’s a wonder that major construction companies haven’t jumped on this opportunity before. I know that it is rare to see a completely blank hoarding around town these days as construction logos are often displayed with unimaginative repetition across the facade. Generally speaking though, when a large hoarding or even a plain public wall is left as mostly blank space then utilising that space for any other kind of advertising whether it be in the way of a graffiti tag or event poster, is not as much a temptation as it in an invitation. Schiavello however have begun to fill their hoarding space with imagery that is worth looking at. Creative advertising of what is happening ‘behind the curtain’ or just a more eye catching and decorative version of their company logo, Schiavello understands that if you present an artwork rather than an incomplete canvas you are more likely to deter wannabe street artists and pesky bill-posters which, in turn, will keep the community on-side during construction by giving them one less thing to complain about. It’s a bit of a throwback now to when we worked on these two projects for one of our ongoing clients, In2Space, but they gave us a great opportunity to champion a variety of the services that we we can offer and now share with you. The impact that a full cover graphic can have, whether it be on optically clear film applied to glass, or to a traditional looking wallpaper, or high gloss vinyl applied directly to your plaster walls, the instantaneous wow factor is imminent. The same goes for your entry or reception signage - many are still in the dark about the fact that Tint Design produce signs! To be fair, it’s not something we’ve advertised heavily in the past, however our experience with signage manufacturing and installation is immense and if we don’t have the immediate solution for you then one of our many skilled and knowledgeable signage consultants will help us out.